The speed indicated on the speedometer. The mass air flow meter power source circuit is open. VG circuit is open or shorted. The E2G circuit is open. If the value is -40°C (-40°F), the sensor circuit is open. If the value is higher than 135°C (275°F), the sensor circuit is shorted. If the value is higher than 128°C (262°F), the sensor circuit is shorted. This is the throttle valve opening amount while the engine is idling (the throttle valve opening amount necessary to maintain ISC air flow). This value indicates the amount of compensation for a decrease in flow passage area due to the buildup of deposits on the throttle valve. Check this value for reference when the engine stalls, is difficult to start, or idles roughly. When the ISC learned value is initialized, performing the following procedures in order to quickly relearn the Deposit Loss Flow value. After the Deposit Loss Flow has been relearned, gradual fine adjustments will continue automatically. Start the engine cold and allow the engine to idle. After the engine is warmed up (engine coolant temperature is above 80°C [176°F]), allow the engine to idle for an additional 5 minutes. Turn the ignition switch off and wait for 30 seconds. Start the engine again, and allow the engine to idle for 5 minutes. The EVAP system pressure is monitored by the canister pressure sensor. Performing the Control the Injection Volume or Control the Injection Volume for A/F Sensor function of the Active Test enables the technician to check the output voltage of the sensor. After driving for approx. 10 min. in an urban area. This item refers to the short-term fuel compensation used to maintain the air fuel ratio at the stoichiometric level. This item refers to the overall fuel compensation carried out in the long-term to compensate a continual deviation of the short-term fuel trim from the central value. Learning is performed when idle with the engine warmed up (coolant temperature is 80°C (176°F) or higher). Learning is performed when driving with the engine warmed up (coolant temperature is 80°C (176°F) or higher) and operating in the low load range (when the range of engine loads is divided into four parts). Learning is performed when driving with the engine warmed up (coolant temperature is 80°C (176°F) or higher) and operating in the mid-size load range closer to the low load range (when the range of engine loads is divided into four parts). Learning is performed when driving with the engine warmed up (coolant temperature is 80°C (176°F) or higher) and operating in the mid-size load range closer to the high load range (when the range of engine loads is divided into four parts). Learning is performed when driving with the engine warmed up (coolant temperature is 80°C (176°F) or higher) and operating in the high load range (when the range of engine loads is divided into four parts). OL (Open Loop): Has not yet satisfied the conditions to go to closed loop. CL (Closed Loop): Using the air fuel ratio sensor as feedback for fuel control. OLDrive: Open loop due to driving conditions (fuel enrichment). OLFault: Open loop due to a detected system fault. CLFault: Closed loop but the air fuel ratio sensor, which is used for fuel control, is malfunctioning. Min. : -64 deg., Max. : 63.5 deg. Before 5 seconds elapse after starting the engine, which is DTC P1604 (Startability Malfunction) detection duration, this parameter indicates the distance driven during the previous trip. After 5 seconds elapse after starting the engine, this parameter indicates the distance driven during the current trip calculated from the vehicle speed signal. Run Dist of Previous Trip in freeze frame data which were present when the startability malfunction occurred (DTC P1604 detected) indicates the distance driven during the previous trip, but in all other cases, such as for the snapshot data of Data List (real-time measurements), or for freeze frame data which were present when the DTCs other than P1604 were detected, the value indicates the distance driven during the current trip. Idle Fuel Cut is "ON" when the throttle valve is fully closed and the engine speed is more than 2800 rpm. The fuel cut being performed under a very light load to prevent incomplete engine combustion. Output only when Check the Cylinder Compression is performed using the Active Test. OFF: Shift lever not in S, "+" and "-"
*1: Excluding throttle valve opening percentage due to idle speed control. *2: Data List values are only displayed when performing the following Active Test: Control the VVT System (Bank 1), Control the VVT Linear (Bank 1), Control the VVT Exhaust Linear (Bank 1). For other Active Test, the Data List value will be 0. (f) Enter the following menus: Powertrain / Engine / Active Test. All the injectors are tested at the same time. Perform the test at less than 3000 rpm. The injection volume can be changed in fine graduations within the control range. Control the Injection Volume for A/F Sensor enables the checking and graphing of the air fuel ratio sensor and heated oxygen sensor voltage outputs. To conduct the test, enter the following menus: Active Test / Control the Injection Volume for A/F Sensor / Data List / AFS Voltage B1S1 and O2S B1S2. ON: Acoustic Control Induction System (ACIS) VSV is on. OFF: ACIS VSV is off. ON: TC and TE1 are connected. OFF: TC and TE1 are disconnected. The idling fuel-cut is turned ON when the throttle valve is fully closed and the engine speed is more than 2800 rpm. Confirm that the vehicle is stopped and the engine speed is 3000 rpm or less. The accelerator pedal is fully depressed (Accelerator pedal position: 58 degrees or more). The engine stalls or idles roughly when the camshaft timing oil control valve assembly is operated at 100%. The test is possible during idle. DTCs related to the VVT system may be stored due to Active Test operation, but this does not indicate a malfunction. The engine stalls or idles roughly when the camshaft timing oil control valve assembly is turned on. The engine is running and idles normally when the camshaft timing oil control valve assembly is off. Fuel injection and ignition stopped in all the cylinders. If the display of the Data List item Catalyst OT MF F/C item is Not Avl, perform this Active Test with the vehicle stopped and the engine idling. If the display of the Data List item Catalyst OT MF F/C item is Avail, perform this Active Test as described below. Stop the engine, turn the ignition switch to ON. Enter the Control the Select Cylinder Fuel Cut. Select the cylinder for fuel cut (cylinder #1 to #4) and turn the Active Test ON (press the RIGHT or LEFT button). *2: When cranking the engine, each cylinder measures the engine speed. In this Active Test, the fuel and ignition of all cylinders is cut. The engine must then be cranked for approximately 10 seconds. At this time, the speed of each cylinder is measured. If the speed of one cylinder is more than the other cylinders, it can be determined that the compression pressure of that cylinder is lower than the other cylinders. Enter the following menus: Powertrain / Engine / Active Test / Check the Cylinder Compression. To display the entire Data List, press the pull down menu button next to Primary. Then select Compression. Push the snapshot button to turn the snapshot function on. Using the snapshot function, data can be recorded during the Active Test. While the engine is not running, press the RIGHT or LEFT button to change Check the Cylinder Compression to ON. After performing the above procedure, Check the Cylinder Compression will start. Fuel injection for all cylinders is prohibited and each cylinder engine speed measurement enters standby mode. Crank the engine for about 10 seconds. Continue to crank the engine until the values change from the default value (51199 rpm). Monitor the engine speed (Engine Speed of Cyl #1 to #4) displayed on the Techstream. At first, the Techstream displays extremely high cylinder engine speed values. After approximately 10 seconds of engine cranking, each cylinder engine speed measurement will change to the actual engine speed. Do not crank the engine continuously for 20 seconds or more. If it is necessary to crank the engine again after Check the Cylinder Compression has been changed to ON and the engine has been cranked once, press Exit to return to the Active Test menu screen. Then change Check the Cylinder Compression to ON and crank the engine. Stop cranking the engine, and then change "Check the Cylinder Compression" to OFF after the engine stops. If the Active Test is changed to OFF while the engine is being cranked, the engine will start. Push the snapshot button to turn the snapshot function off. Select "Stored Data" on the Techstream screen, select the recorded data and display the data as a graph. If the data is not displayed as a graph, the change of the values cannot be observed. Check the change in engine speed values. 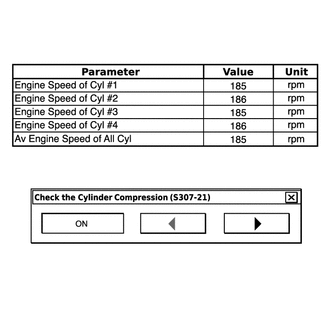 As the data values of the Active Test return to their default values when cranking is stopped, the engine speed value of each cylinder cannot be observed. Therefore, it is necessary to use the data recorded with the snapshot function to check the engine speed values recorded during cranking. Performing a System Check in the Utility menu enables the system, which consists of multiple actuators, to be operated without removing any parts. In addition, it can show whether or not any DTCs are stored, and can detect potential malfunctions in the system. (d) Enter the following menus: Powertrain / Engine / Utility. (e) Perform the System Check by referring to the table below.